Every project has its set of requirements and goals. Grouping projects lets you view projects having common elements together, whether it's the same client, owner, or any other criteria that suits your business. Project groups can be created from the Portal Settings page. 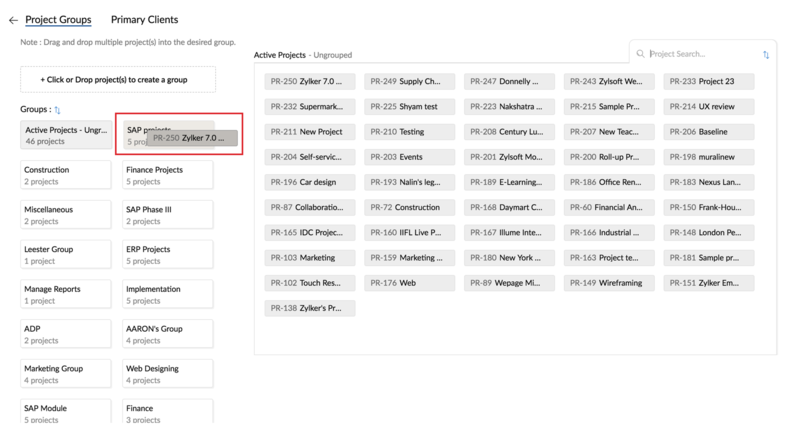 Navigate to Projects and click in the upper-right corner and select Manage Groups. Click or Drop projects(s) to create a group. Alternatively, drag and drop projects to +Click or Drop projects(s) to create a group. Add projects to groups with a simple drag-and-drop. Navigate to Projects and click in the upper-right corner. 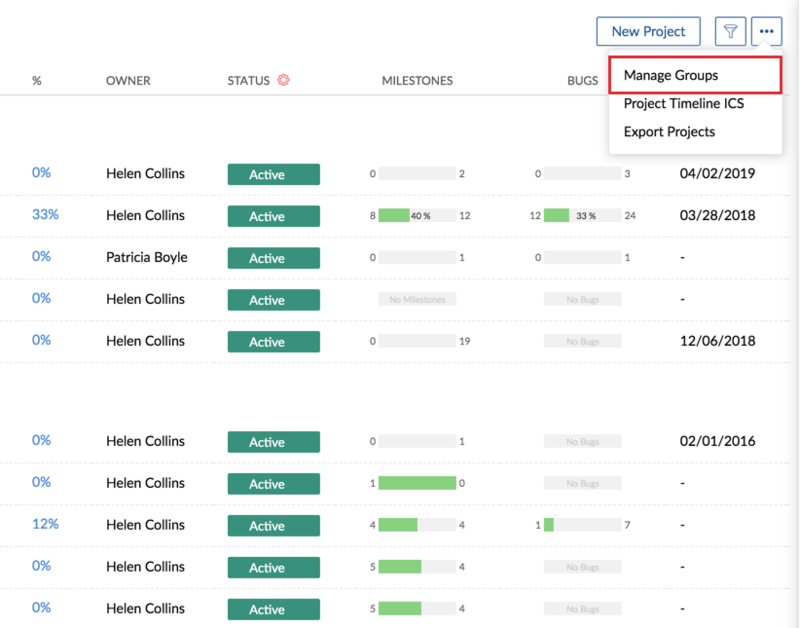 Drag a project from the Active Projects window and drop it into the desired project group. Hover over the group name to see the edit option. Click to change the group name. Click on the project group to view all the projects within it. Select the desired project group and click in the group window. Drag and drop projects and click Save Order. 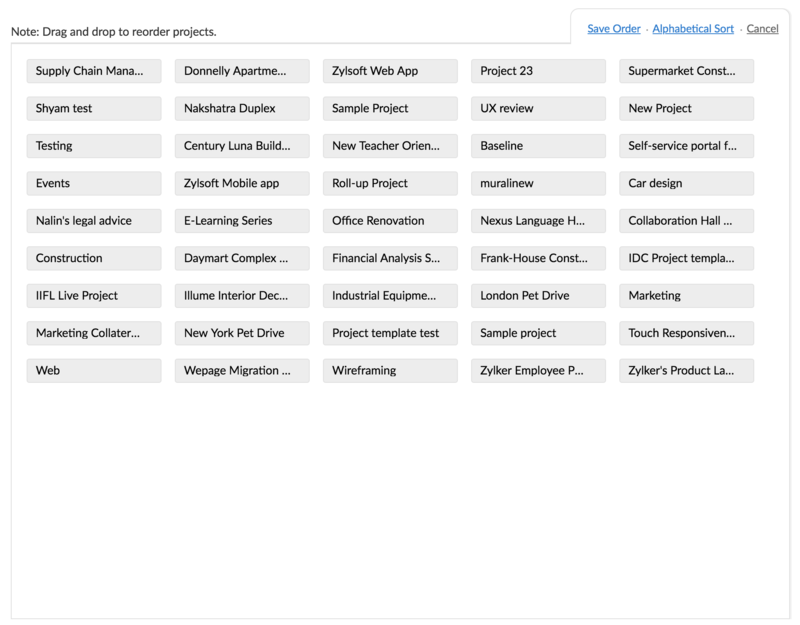 Click Alphabetical Sort if you want to reorder projects alphabetically. Hover over Groups: and click . Drag and drop the groups and click Save Order. Hover over the project group and click to delete the project. However, any projects associated with the project group will not be deleted. Projects will be moved into Active Projects. A warning message is displayed, when you delete a project group. When creating a new project you can associate to a group or add it to a new group. To learn more about creating a new project click here. Drag and drop projects from their groups to Active Projects. The projects are now ungrouped. You can click the Primary Client tab to view the client projects and associate projects to the desired client group. Drag and drop the project into the desired client group. Projects that are not associated with any client group are available in Active Projects group. You can search for projects using Project Search. However, it is case-sensitive.